Great tour of the grounds and the Magnola Plantation house. Our bus guide, Alan, was first-rate; funny but also filled with information! Tour was great. Enjoyed the tram ride and the gardens were stunning. Valerie made the bus ride fun! This was a wonderful tour. There was the right mixture of walking, riding, touring the mansion and free time to explore. Highly recommend it! Great guide! Loved the tram tour of the swamp and the walk around the gardens was wonderful. I never would have appreciated the gardens without the guide. The tour of the house was interesting but i would have preferred a longer tram ride. The transportation to and from the plantation made everything very smooth and relaxing!! Such a great day out! 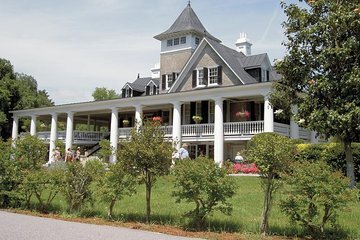 Plantation is only half an hour from the pickup at the Charleston Visitor Centre. Tour started with a walk around the grounds with some fascinating facts, then a nature tour on board a little train with wheels, then finished with a tour of the house sadly cannot take any photos inside. When the flowers are in bloom it is very pretty, and lots of wildlife was spotted a few gators, a multitude of birds including an owl and you have about 25 minutes at the end of the house tour to grab lunch/check out the gift shop/have a look at the petting zoo!